Reflections of a Grady Doctor: Love, Lake Erie, and Lessons Learned. Cleveland, Ohio on Lake Erie. When I started my internship back in 1996, I was new to Cleveland, Ohio. Because I hardly knew anyone there, I pretty much went to work and went home every single day. Occasionally, I would join my co-interns for meals or drinks or even rollerblading in the park. But other than that, my personal life wasn't too exciting. This was fine because internship is hard. On most days, I'd go home and crash on my couch in front of my television. But there was this one month I had that wasn't too strenuous and I began to realize how blah my life outside of the hospital had become. I told myself that I really needed to "get out more" and"meet more people" so I dug through a drawer and found a scrap of paper that a friend had given me prior to my move there. It was the name of one of her "good friends" who was one of those people who "always knew where the party was." Now most of the time when people suggest such things to me, I pretty much smile and say, "Oh sure, okay" -- knowing deep down that I will never ever call or email or whatever they are suggesting. But this was Cleveland, Ohio and I wasn't from there. I was officially desperate. 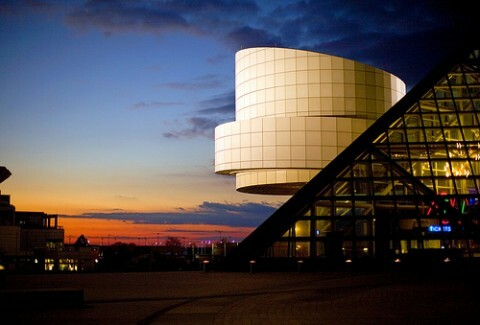 Cleveland, Ohio is filled with one thing in great, great abundance. And that is people from Cleveland. And if they aren't from Cleveland, they are from some other part of Ohio or married to someone from Cleveland. So what does this mean? Well for me, the twenty five year-old woman who was living there at the time, this meant that everyone socialized around their families and old friends. Everyone. 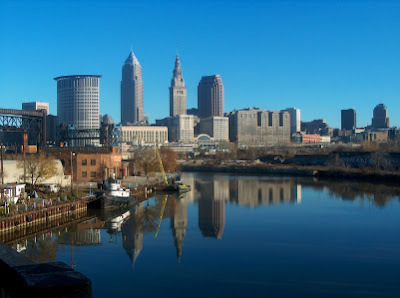 And though that is one of the very sweet things about Cleveland, Ohio, at times, that was one of the hardest things about living there and not being from there. "The Jake" -- which I think is now called something else. Me on my day off: "What are y'all doing tonight?" Friday night? "Bidwist and Spades at Auntie Carol's house! Wanna come?" Saturday night? "My cousin Marco is having a cookout! Or my high school buddies are all meeting up somewhere! Wanna come?" Sunday night? "Oh yes! (insert - mom, grandmama, mama and grandmama, sister, uncle, cousin, great auntie, et.) is making Sunday dinner. Wanna come?" Arrrgghh! This is no exaggeration. And that was hard for me because I was one of the rare transplants there. And that was rough. So this phone number belonged to this dude who not only LIVED in Cleveland, but who allegedly was one of the very, very few who was not FROM Cleveland. In fact, the dude was from Brooklyn, New York which I decided sounded cool enough for me to save the number. It turns out that this dude was indeed the "dude to know." The day I rang him up, he was coincidentally having a house party that very night. "Come through, yo," he said in this voice that was definitely a cross between genuine interest and whatever-ness. But it had that touch of New York on it that intrigued me. I then did something totally out of my character--I got dressed and went to a party across town given by a total stranger and full of other total strangers. Just great. And so. I go to this party which is packed full of people. The girls are all cliquish because clearly they all know each other from high school or from Ohio State. (Or Miami University of Ohio.) Um, yeah. The dudes are carefully eyeing me over and wondering who I'm there with. Eventually I meet Brooklyn-to-Cleveland Party Dude and he greets me with that same hybrid of genuine interest-slash-whatever-ness. "Hey! What's up, yo?" That's when this guy attending the party says to me, "Damn, you know all the words to that song?" Feelin out of place 'cause, man, do I miss. . .
Hit the studio, 'cause I'm paid in full. . .
Then we both started laughing. That's when I realized that he was kind of cute. Even more than that--he was very cute. We chatted some more and I learned that he, too, was one of the few Cleveland transplants who'd come to this party just to get out of the house. After lamenting a bit about what it feels like to be in Cleveland but not from Cleveland, we agreed to exchange numbers and meet up some day. Well that "meet up" became a date. And subsequently became a relationship. In fact, it was one that got quite serious, actually. So serious that I forgot all of my criticisms of Cleveland, Ohio and found myself complimenting things like the Rock and Roll Hall of Fame and Jacobs Field because they'd proved to be choice locations for budding romantic outings. We officially became a couple. A transplant couple hanging out all around Lake Erie. One year later, work transferred him to another city pretty far away. But we continued a long distance commitment. I'd see him on all of my vacations and he'd visit often. He was nice to me and for the most part, there was nothing much wrong with the relationship other than the fact that we were broke and in separate cities. Two plus years into our relationship, he decided to apply to graduate school. I'd been asked to be chief resident at this point so that meant once he started school, we'd both have two more years before finishing up. I naturally assumed that grad school would be somewhere at least driving distance to Cleveland. Or better yet, at Case Western. Anyways. Around that time, I had gone to Columbus to visit my friend and med school classmate Jada. Jada and her husband Felix had moved to Columbus for Jada's residency and having them so close was a godsend. On this particular weekend, I was chatting with them about my relationship and my honey's upcoming grad school plans. "That's great that y'all will be closer together!" Felix said. "Ohio State, Case and even Michigan are all close. Is that where he's looking?" I actually wasn't sure. So I said that. "I'm not sure. I'm assuming so." And Felix said, "Once Jada and I got very serious, I knew I wanted to be wherever she was. Sometimes it's not in your control to be together. But when you have it as an option, what you do with that option says a lot." He kind of just left it at that. I let that marinate and remarinate. I thawed it out and marinated it again. Something told me to pay attention to those words, so I stuck it on a post it note in my head for later. A few months later, I was visiting my man-friend during a vacation. We had just toasted to our two and a half year anniversary and to me getting asked to be chief resident. And that's when he dropped the bomb on me. "Good news. I've been accepted at UC Berkley and at Emory." And that needle scratched the record loud as hell at that moment. UC WHO? Emo-WHAT? Unless there was a University of Cleveland at Berkley, neither of those options sounded close. And the operative word there was "option." "Did you get accepted to Ohio State? Or Michigan?" I implored. He looked down and sighed. "I didn't apply there. I just really wanted to go somewhere outside of the midwest." My head was swirling and my feelings were definitely hurt. He had an option. He did. What did this say about me? About us? Nothing? Everything? I wasn't sure. "Did you apply anywhere near where I am?" Without making eye contact he shook his head no. "I accepted the position at Emory." And that was that. No discussion beforehand or anything of the sort. I lived in Cleveland, he lived in far-away-from-Cleveland and had been given an option to go somewhere-anywhere and had chosen to move to even-further-from-Cleveland. "This doesn't mean we can't make it work," he mumbled. "I just. . . I just wanted to go to a better city." A better city? That stung even more. Now. Let me be clear on something: This guy was not a bad boyfriend. He was thoughtful and romantic and reliable and kind. As far as relationships go, this wasn't a bad one by any stretch and I would be hard-pressed to find some awful quality he had that made him such a horrible person to be with. But still. He had an option. This time, even if it meant a bit of sacrifice, he had an option. And his option was not selected with me as a major factor. A surprising amount of peace and clarity came over me after that announcement. I remembered Felix saying "I just wanted to be wherever she was." And yes, I recognized that Felix was Felix and this-guy was this-guy but still. That made me wonder about our two years and where I stood on the priority totem pole with him. When he dropped me off at the airport at the end of that trip, I looked over at him with tears in my eyes. "You know what? I'm not her." "I'm not 'the one.' If I was, you would have found this decision harder to make. It would have involved me more and the thought of being apart for two more years would have been more of a struggle. If I were 'her' -- or 'the one' -- I may have even been able to compete with cooler cities. But I couldn't since I'm not her. And you know what? That tells me that you aren't 'him'." He looked crestfallen. "Are you breaking up with me?" "You broke up with me already," I replied quietly. "And it's okay. I'll be okay." "But I don't want to break up," he said. "I don't." "I don't want to be in a situation where I'm an afterthought. I don't. The man for me would have at least applied to Michigan or Ohio State. And the woman for you would have made you want to do that." I have no idea where this zen came from. But it came from somewhere strong that I didn't even know was inside of me. And I'm so glad it was. Today I am a forty-one year-old married woman and I know how wonderful it feels to be a forethought and not an afterthought. And it was worth the wait. When Harry and I were about to get married, we had this lovely rehearsal dinner where people stood up and gave these heartfelt toasts. One of the toasts was from my maternal grandmother who had known over fifty years of marriage to one true love. She shared a few words about her experiences and after the dinner was over, she pulled us aside for more words of wisdom. There's wisdom behind that smile. "Remember," she spoke firmly,"marriage is an unselfish walk. Every marriage that fails--every single one--they fail for one main reason: selfishness. Not spending time with your spouse? Selfish! Spending all the money? Selfish! Not helping around the house? Selfish! Only doing what you want to do? Selfish! Not helping with the kids? Selfish! Not making love because you don't want to? Selfish!" And, of course. We both knew there were caveats like addiction strongholds, mental illness, and tragedies. But she was talking about her experiences with most marriages. And she had earned some authority on the subject. Us? We were riveted. She was preaching, do you hear me? Preaching! And she didn't stop there. Grandmama never has been shy. "And not forgiving each other? That's selfish, too. If you aren't ready to think about someone else as much if not more than you think of yourself, then you aren't ready for marriage. And you definitely ain't ready for marriage with children. But if every day, you get up and you think about how you can make each other's life easier and better today? You will always be together. So talk to each other. Listen to each other. Put each other first and make sure the other person always feels that way." I remembered all of those words and always will. I think of that advice nearly every single day. We keep this photo on our wall to serve as a reminder of what Grandmama said. Today I was reflecting on my marriage to Harry and how --- dare I say it? -- easy it has been. I am thinking about how good it feels to be first on his agenda. And my grandmama was right. That takes an unselfish heart. But now I know it also takes a level of maturity and readiness that some don't ever have. I also know that the right person can ready even the wrongest person. If and only if they are the right person. Sometimes? Sometimes you just have know when you're not "her." Or not "him." Because sometimes, you're not. Just because a person is nice and cool and attractive and unmarried and in a relationship with you doesn't mean that they are "the one." And just because they know all the words to one of your favorite old school rap songs and just because they make you a mix tape with that song and twelve others on it, does not a future spouse make. Nope. It could mean that they're bored. Or scared. Or just waiting for someone other than you. I said it. Other than you. It's been said many times over, but I'll say it here, too. Perhaps--just perhaps--whoever it is just isn't that into you. And the kind of "into you" you need for drama-free love takes a helluva lot more than nice biceps, straight teeth and a shiny car. Or maybe they just aren't ready to be unselfish for you. Just maybe something about you doesn't make them deeply yearn to put aside their immediate desires for yours. And you know? It is what it is. After two years? It's either it's a green light or a red one--whether you want to believe otherwise or not. I'm just saying that it just shouldn't be that hard. And when it's the right person? Living in a crappy city is a sacrifice you will at least consider. But again--you have to be ready. And you can't make anybody get ready. No matter who they are and how much you try or how many kids you have or how much history you have together. It isn't exactly an age thing either because there are some very ready young people and some really NOT ready older folks. Again, it's either a green light or a red one--and even if you choose to keep running those big red lights, that doesn't make them turn green. "The only way you can be ready to put your spouse first is to have first had practice doing the same for yourself." Other than that, I'll say everything else she said. Wisdom sealed with a kiss. I know. I haven't been married 50-something years. And no. I don't know exactly what the future will hold. But I do know this: When people show you who they are -- and where they are -- especially in relationships, you should believe them.
. . . .and this. . . . .
. . .and especially THIS. . .because I am so thankful for the BHE coming into my life! I can rock out to this for hours--it's one of my BHE anthems! This is the truth -period. Also, I just want you to know what a treat it is to wake up on Monday mornings and read your Sunday posts! It is a lovely way to start my week! Thanks MFM. It takes a while to learn but once we do? Nirvana! Never apologize for getting Cleveland Rocks stuck in MY head. :) As a Lakewood girl, I still like it every time I hear it. And I'm not saying all of that time is wasted. It's not. But if you're looking for the ONE and yet you're with the not-one...well...how are you going to find him? You were very wise to realize that that very nice man wasn't going to wake up one day and suddenly know that you were the one. Wise and brave. Also- I love your grandma. She's right and I need to remember her words more often. I have a problem with being selfish. I do. Don't we all have a problem with selfishness, Sister Moon? We're all works in progress. Thanks for sharing this. Your grandmother's words of wisdom are so true and I think I needed that reminder about selflessness today. Thank God for the strength you showed not to settle for something that was less than what He had for you. Your family is a testament to what we can have if we pay attention to that voice within. Whoops--forgive all those crazy looking comments from me. I was on my iPhone and was using the "reply" button which apparently doesn't translate on my laptop. Ha. Nola, Maria, Kelsey, Ms. Moon -- those replies were for you respectively. Stace--I'm glad Felix had given me that little nugget. I think that helped me to put things into perspective. I really do. So awesome!!! I convinced my best friend into a relationship with me (that I knew in my heart at the time he didn't want) then eventually tried to convince him he wanted to marry me on a certain timeline. I can't even say I knew it was crazy then! I know it now but I certainly wasn't brave enough to get out when I knew it was going down hill. And I wasn't happy when he did. But I'm DELIGHTED that he did! Made way for me to get myself together in preparation for the man I will be with for the rest of our lives!!! Shoutout to your grandma!! Do you know my Bible plan lesson for the day was about selflessness? I heard it even more clearly when I read this post! I called one of my friends who needed me and I'm currently planning something awesome for the husband! So excited!!! Thanks for this- I'm currently working through whether couples matching for residency is the right thing to do and a lot of this has been on my mind. your grandmother was a smart woman. So much wisdom in this post from both you and your grandma. Thank you. I wish I could send this post to a lady that called into Ryan's Roses this morning. Ryan's Roses is on KIIS FM out here. Someone who suspects their mate is cheating writes in to Ryan Seacrest. Patti from the station calls the suspected cheater, offers them a free dozen roses to send to whoever they want along with a note... we all wait to see if he's going to send them to the wife/girlfriend, or to someone else! Today, Evelyn called. She has been dating Danny for a year & they had talked about moving in together. Lately, Danny's been acting distant, just not himself. And he wasn't talking much about moving in together. Patti calls him, he sends the roses to Evelyn. When Patti asks what to put on the car, Danny basically breaks up with her with the roses! So Ryan comes on the phone & tells Danny what's going on... that he's on the radio. Evelyn comes on & Danny tells her that he thinks she is amazing, but she's just not the one for him. He told her "You're going to make some other man very happy one day, but I know this isn't the right relationship for me." Evelyn cried & pretty much begged (which made me sad) but Danny knew she wasn't the one. Okay, this is nothing like your story, but I wish Evelyn could know that Danny is doing her a favor. You know I went through a similar thing with my ex. Sometimes people think I'm mad at him or have hard feelings, but the truth is that he knew I wasn't the one. I appreciate that he didn't string me along, which he easily could have done. After a little while of being hurt... actually a lot shorter than I expected, I also knew he wasn't the one for me. I don't know who IS the one, but I know it's not him. And I know I'm not blocking the path for whoever THE ONE is by hanging around with the NOT-ONE. LOL. Thanks. I love this post & you too! Thank you, Bumble Bizzle Bee! I love you, too. It's funny I am a non-traditional medical student from Arkansas who will start my intern year at Emory in Med/psych. I happened upon your blog today, by of all things googling what a positive PPD looks like. Ha! Ha! See I recently did a month long rotation in S. Africa and was quite nervous about my PPD due to the prevalence of TB in the country. Well, I had a PPD administered and it did exactly as you described and I thought, "Oh Lawd nah." Well since I have encountered your blog, I simply can't stop reading. What you have been able to do is the mark of sincerity, passion, and giftedness. Your writing draws me in. This particular blog made me reflect on the moment when I realized the man I loved more than the air I breathed "was not him." This was the toughest journey I ever had to make because it entailed traveling through Pain. It wasn't easy but I have moved on. Though I am still alone, I realize that it is worth it because I want the beauty that comes from an ordained relationship. Thank you for being so transparent and using your words to build up and empower. By all means, please keep writing because you flow in it. I can't wait to meet you, Vera!